Sir,Thanks...Can we get score book for tamil meduium? Thanks for the information which you have provided.Tenth class is most crucial class of our education system.It is the class which decides the stream of student in which he will make his career. full score book i need . is it possible? waiting. March 9, 2013 at 9:33 AM delete This comment has been removed by a blog administrator. 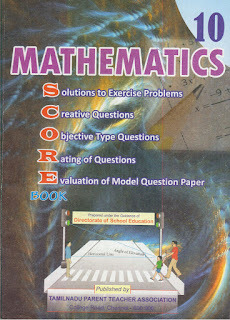 can we get pta maths book for 12th??? Sir upload the full book Sir And it will use full for me a lot upload it or please Send us via my email v.yogeshvisu@yahoo.com it is my horrowed request . And i am weak in maths If you do it i would never forget your help till my life please sir !!!!!!!!!!!!! pls upload full score book sir. January 2, 2016 at 12:01 PM delete This comment has been removed by a blog administrator.